1. 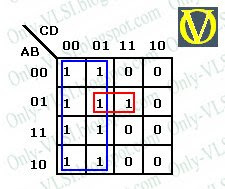 What is DeMorgan's theorem? (ABC..N)' = A' + B' + C' + ... + N' -- The complement of the product is equivalent to the sum of the complements. (A + B + C + ... + N)' = A'B'C'...N' -- The complement of the sum is equivalent to the product of the complements. This relationship so induced is called DeMorgan's duality. 2. F'(A, B, C, D) = C'D + ABC' + ABCD + D. Express F in Product of Sum form. 3. How many squares/cells will be present in the k-map of F(A, B, C)? F(A, B, C) has three variables/inputs. Therefore, number of squares/cells in k-map of F = 2(Number of variables) = 23 = 8. 5. Simplify F(A, B, C) = Σ (0, 2, 4, 5, 6) into Product of Sums. The 0's are grouped to get the F'. 6. The simplified expression obtained by using k-map method is unique. True or False. Explain your answer. False. The simplest form obtained is not necessarily unique as grouping can be made in different ways. 7. Give the characteristic tables of RS, JK, D and T flip-flops. 8. Give excitation tables of RS, JK, D and T flip-flops. 10. Design a counter with the following binary sequence 0, 1, 9, 3, 2, 8, 4 and repeat. Use T flip-flops.